Too many years later I still have a big pile of plastic, lots of good intentions but an unfinished model. My original inspiration is reproduced on the left. My efforts to date are displayed below. Who knows, one day perhaps I′ll finish it and take to the local lake to sail. 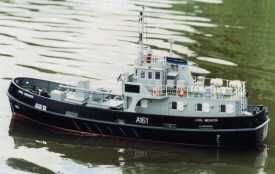 The model is a Model Slipway kit based on the Loyal Class fleet tender to a scale of 1:24. These Royal Navy fleet tenders built by R. Dunston at Thorne between 1974-76 are now mostly sold out of the service for use as diving support or oil rig support vessels. I even tidied up the workshop before I started! You don′t actually need a vast array of tools but a good sharp knife, a cutting mat and a straight edge are essential. The kit comes with helpful hints to get you started and step by step instructions that don′t get too complicated. 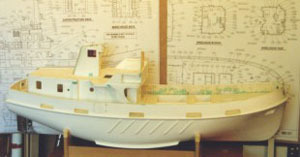 The hull comes as a one piece GRP moulding. This is of good quality but needs some cleaning up. The bulwarks are moulded in but need some filler on the inside to help hide the glass strands before painting. Oh yes the instructions said a stand was a good place to start (1). 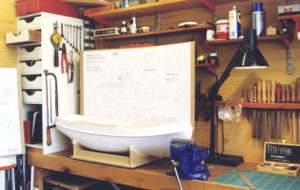 I built mine from ½ MDF. Image (2) shows some of the superstructure in place. The cabin assembly simply lifts off being built around a 25mm high coaming that surrounds the main access to the interior. I thought it might be a good idea to see what the real thing looked like so on a day trip to Portsmouth I found Dornoch. This isn′t actually Loyal Class but a near relative, one of the Cartmel Class fleet tenders. I took some photos to get an idea of the detail for fixtures and fittings. 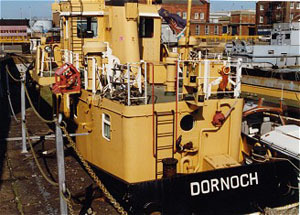 Dornoch, as can be seen, is no longer in service with the RN and I am not sure where she is today. Photo (3) is a view from the stern looking along the port side and shows the fairly limited deck space. Photo (4) is a close up of the bridge, you can just see the navigation lights on the bridge wing. 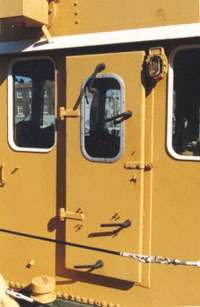 The bridge door showing hinges, window fitting and closures (5) and a close up of one of the numerous bulkhead lamps, supplied as white metal castings for the model. 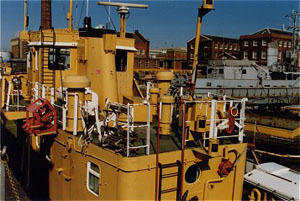 As you can see the area aft of the bridge (6) is crowded with ventilators, life raft fittings, water tanks (beside the funnel) and an assortment of lockers. 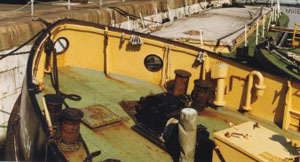 This is a detail of the bow, (7) the small winch has only a single drum and a single cable lifter. There is also only one hawse pipe and anchor on the starboard side. 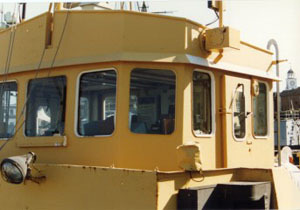 The Loyal Class have two and a larger winch. 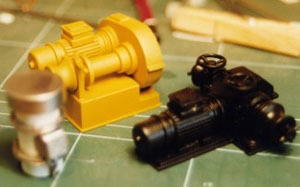 Photo (8) shows two winches from the model at different stages of painting together with a rather out of focus ventilator.